With outdoor weddings becoming ever more popular with couples as so many choices are becoming available from tipi tents, marquees we can see why couples are choosing to have a more relaxed alfresco setting for their big day! 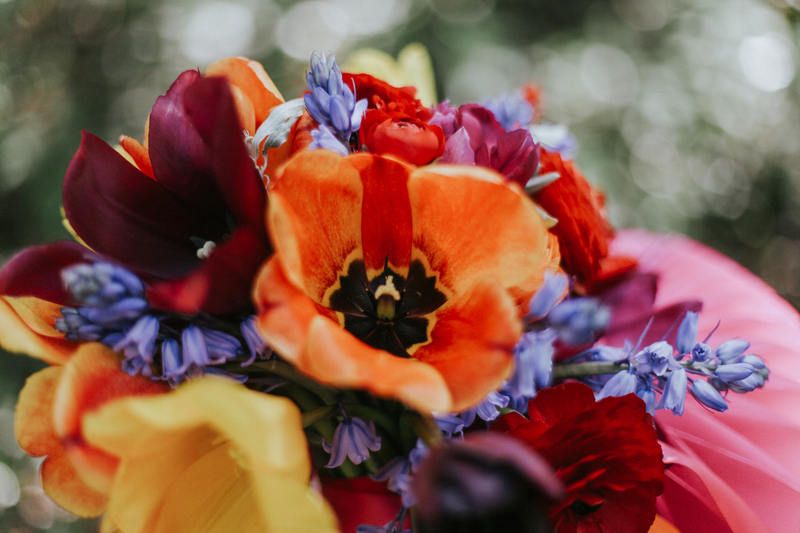 TNWS photographers Fox & Owl talk us through one of their most recent shoots “Fiesta in the Woods” to show couples how beautiful an outdoor wedding can be! Martyn Roper and Chloé Grayson are partners in life and the team behind the recently launched wedding photography and design brand, Fox & Owl. Some may refer to them as the quaint duo in love with the outdoors and avant-garde living. Though they like to think of themselves as the honoured witnesses to special and unique moments in life. “One of the most brilliant aspects of being photographers is that we get to meet so many exceptionally talented and creative people—and it is even better when we get to work with them. 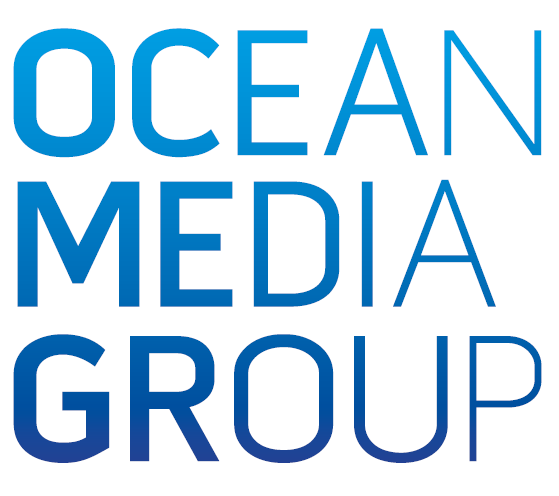 We find it really exciting to work alongside other people in the industry, to observe each person adding their own individual personality to the project and to collectively produce something unique. We teamed up with a bunch of very inspirational local vendors, who all worked incredibly hard organising and carrying out preparations. 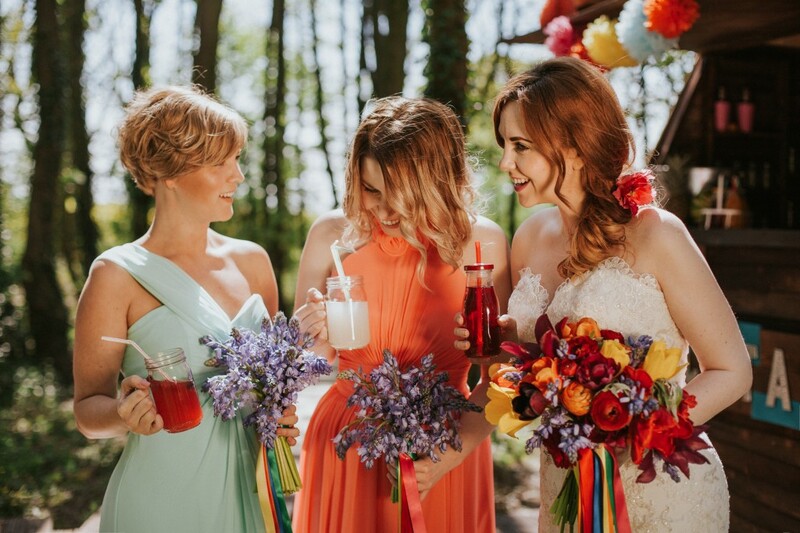 As a group, we wanted to put together a styled shoot that was bold, full of colour and a lot of fun—we quickly opted for a summery fiesta theme. 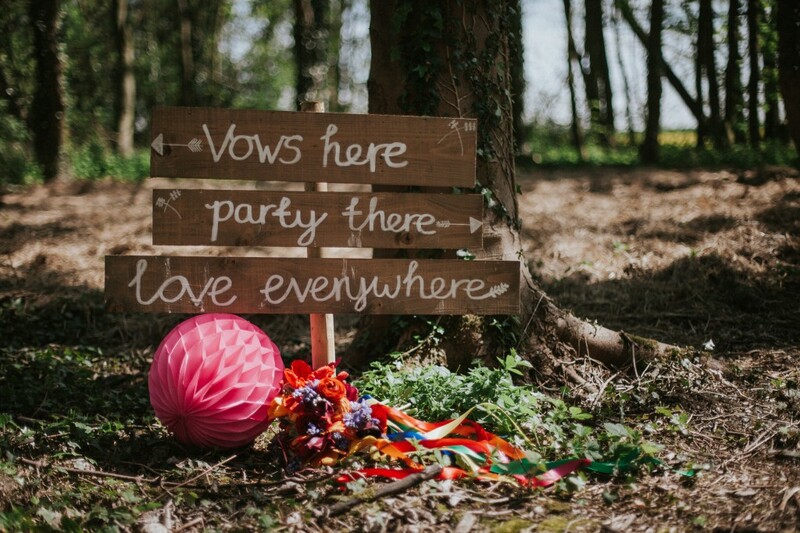 Our Fiesta in the Woods provides the perfect inspiration for any laid-back brides out there. In a beautiful Yorkshire woodland setting, the fiesta took place on the brightest day the UK has seen this year. The glorious sunshine and breezy weather added so much to the atmosphere, casting an array of dancing leaf-shaped shadows onto the ground. With an intimate three acres of woodland in Leeds, Applewood provided us with the perfect backdrop for this outdoor wedding shoot. We made the most of the venue’s woodland walks, ceremony area, cocktail shed and decking. The way-finding signage pictured throughout the shoot was also the perfect way for us to tell the ’story’ of the day in a more coherent manner. The fiesta look is quite laid-back and is the perfect theme for adding splashes of bright primary colours amongst more traditional and neutral tones. Whimsical Events adorned the trees with festive crepe streamers and hand-made tissue paper pom-poms that bounced around excitedly in the wind. Applewood’s cocktail shed and decking area were dressed up with more of these pom-poms as well as fruity paper pineapples. Little details were important too. Astring of pink Flamingo fairy lights injected some light-hearted fun into back of the shed. Both the bar and tables were decorated with vibrant food objects and party cocktails. Not for the traditional, our three tier cake boasted every colour of the rainbow. The eccentric base, which looked like it had been caught in the middle of a paint party, juxtaposed with an elegant top tier arrangement of icing flowers and ribbons. Taking on bespoke projects to match their clients’ personalities, Debbie Gillespie Cake Design is no stranger to unconventional requests and here is the evidence. Our woodland fiesta was further beautified by the wildly romantic British flowers; locally grown, cut and arranged by Owl House Flowers. Organic, colourful and relaxed in style, the bouquet and arrangements fit in with the theme just perfectly. A shimmering lace mermaid bridal gown with a strapless sweetheart neckline and a delicate satin waist band was worn by our model bride, whilst the model bridesmaids wore colourfully mismatched chiffon dresses. Keeping in with the theme, one was a floor length, flowing, multiway, mint coloured dress and the other was an A-line, floor length, halter neck, coral coloured dress. These outfits certainly popped out from the earthy tones of the woodland setting, whilst simultaneously complimenting each other. All three Alexia Designs dresses were provided by the bridal boutique, Alison Jane Bridal. Remembering the carefree, fun fiesta atmosphere we wanted to create, the models’ makeup was kept quite simple. We didn’t want it to look overdone. Neutral tones were used to avoid clashing with the vivid colours of the decor and flowers. This also gave the ladies a more natural, youthful look. As did their hair; styled into soft, loose waves and curls. See more from Fox & Owl in Manchester this Autumn on Stand B60.